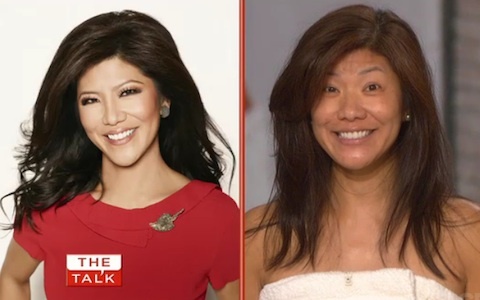 "Do not adjust your TV sets," Julie Chen said, at the start of today's episode of The Talk. "This is what we all look like without makeup on." The hosts of CBS' daytime talk show The Talk took it all off for today's Season 3 premiere. They stepped out onto the stage to start off the episode dressed in fluffy white bathrobes and wraps, and showing off their bare faces and natural hair. For those who haven't seen the episode yet, spoilers and photos ahead! There was an excited mood among the hosts of The Talk at the start of the episode today, as Julie Chen, Sharon Osbourne, Sara Gilbert, Sheryl Underwood and Aisha Tyler came out on stage dressed like they were ready for the spa and showing off their bare faces. 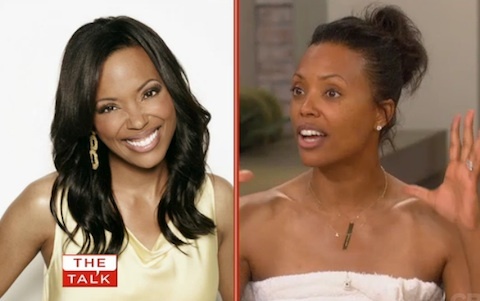 They're all beautiful women, but the side-by-side comparisons featured during the first part of the episode, showed what a drastic contrast there was between how they look when they're normally done up for the show, and how they looked today. Though they admitted to being nervous about going make-up free today for the Season 3 premiere, the mood was upbeat and they all seemed to be into the concept. And it helped that they weren't alone in their efforts. The entire audience went makeup free today, as did their guests, which included Jamie Lee Curtis. Curtis went out of her way to prove she had no make-up on by using a wipe to dab her face. She went on to say some really positive things about what they've decided to do in showing up bare-faced. "It is truth in advertising," she said. "And advertising is all lies. And so the idea that you are actually doing something like this is so revolutionary and beautiful. And I'm telling you, the impact that this is going to have - you have no idea." Curtis brought up the the difference between using make-up to accentuate one's looks versus using it as a mask and trying to hide something about their looks. It's an interesting topic, and one well worth addressing during an episode where all of these women have stepped up and literally showed us their true faces. The season premiere ran as usual, with celebrity gossip chatter and their scheduled interviews, but the drastic change to their appearances certainly made for a memorable start to the series' third season. Good for the women for showing off their natural beauty. Watch the full episode here. The Talk airs Weekdays 2:00–3:00 PM, ET; 1:00–2:00 PM, PT on CBS.